Many years ago immigrants came to America to live the American dream, to prosper and to be free. Today, in an effort to fundamentally transform America, immigrants and refugees have an entire different agenda. While not every immigrant or refugee has this objective, the vast majority of Muslims do. It is called the Hijra. The Hijra (migration) is part of the doctrine of Islam, which recognizes how their prophet Muhammad traveled from Mecca to Medina. The hijra led to jihad, which ultimately led to Islam being victorious. This is the goal of every “good” Muslim, to enter countries that are not Islamic, undermine their entire society, and once established, implement Islamic law, Sharia. 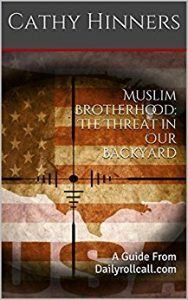 Across the globe it isn’t hard to witness the turmoil being created as Muslim refugees refuse to obey they laws of the land, and create chaos. Look towards Europe and compare the beginnings of the same. In America, every protest, and riot was either lead by, or promoted by Muslim organizations and their leaders. Every single one, starting with Ferguson. Fast forward to this weekend,with the implementation of President Trumps suspension of the immigrant and refugee program (from 7 Muslim dominated countries) to which thousands of protesters showed up at airports all across the country as Muslims from those countries tried to enter the United States, but instead were detained. One has to question how legitimately spontaneous they really are. It takes massive organization and communication to gather thousands together on a moments notice, including the signage. But as we have learned, the protests occurring at JFK airport In NY, are spearheaded by Fahd Ahmed*, a self proclaimed undocumented Pakistani, who is the executive director of Desis Rising Up and Moving (DRUM). Fahd, an attorney who graduated from Vanderbilt University in Nashville TN, also is active with the American Muslim Civil Leadership Institute, a partner of the Muslim Brotherhood’s Bin Talal Center. According to their website, (DRUM) it states: ” Our cornerstone is building strong cross-community alliances across the U.S. and globe to amplify progressive movements- with African Americans, Latinos, Indigenous communities, Arab and Middle Eastern communities, labor, youth, civil rights, and Global South movements from Egypt, to South Asia, to Latin America”. All the same communities Muslims in America are supporting. Of course with help from the George Soros Open Society Foundation. From the African American Black Lives Matter group, to the Tennessee Immigrant and Refugee Rights Coalition (TIRRC), to the American Civil Liberties (ACLU), all of which have received thousands to millions of Soros’ dirty money. Fahd isn’t exempt from that either, as he was the recipient of a fellowship from the National Lawyers Guild, who garners donations from the Soros foundations. Funny how the ends always goes back to the means. Muslims portraying themselves as victims, garnering massive support and sympathy, and the leftists, globalists, and socialists, all running to fund, protest, and support them. American protesters have shown they know nothing about what or who they are protesting for. Little do they know as the Hijra progresses, they will all be forced to convert to Islam or die too. *The current status of Fahd Ahmed is unknown, although his executive profile for DRUM still shows undocumented. HT to SC and DRT for info on Ahmed! Next → Next post: It Isn’t Islamophobia When Muslims Kill Muslims. Ms Cathy, you are spot on. Was at Vanderbilt in Nashville today, hotbed for progressives, up to their eyeballs in support of these radical Islamic Jihadists. It is more than apparent these folks have no clue to history or what they are being herded for in demonstrations. Used like a herd of cattle singing praises for some unknown reason they can not relate. Sometimes it is like banging your head against a wall.. Want to rid the nation of these acfkwheats, these mugnoons, Y’ill an deen these Mugnoons. As for Fahd Ahmed, he will die by his own preaching and bring one hell of a lot of greif to the nation. Fahd teckie min teasic an min timec.